Don't get caught looking unprofessional when you simply write a dollar amount on the back of business card for a purchased gift certificate. 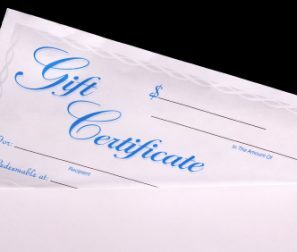 Don't hassle with your desktop printer to print gift certificates on-the-spot when the person purchasing the certificate is trying to get in and out of your business quickly Allow us to professionally produce gift certificates for you with matching envelopes. It will make you look more professional and make a great impression on the person receiving the gift certificate.